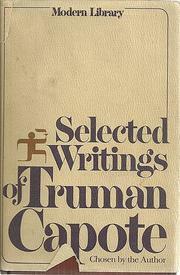 Surprisingly enough, these Truman Capote writings cover 20 years; one would not have thought he'd been at bat that long. Not too surprisingly, they don't all hold up; but, generally, it must be said he scores more often than he strikes out. Certainly his talents are manifold: the quicksilver dialogue, the damning details, the mot juste, the psychologically perceptive blue mood or set. His influences abound, yet he remains an original, from the early Southern Gothic tales with auras of Williams, Faulkner, McGullers and, in that famous shocker Miriam, of Alfred Hitchcock, onwards through Breakfast at Tiffany's and its jazzed-up Christopher Isherwood type heroine, Holly Golightly, plus the New Yorkerish reportage of Porgy and Bess' Russian tour, of Marlon Brando, of travelogues via Ischia, New Orleans, Spain. All and more are here collected; most good, most entertaining. But is he a major writer? No, not by these samplings anyway. Is he even the sure stylist such a tough minded person as Norman Mailer takes him to be? No, not if we compare him to a newcomer like Updike, an oldster like Miss Porter. But he is an exquisitely exotic bloom on our all too exoteric literary landscape, full of variety, full of change. Given a few more imaginistic flights in as many years, he might yet emerge the American Coeteau. Not an unrewarding prospect at all.